If you are looking for online jobs or work from home jobs you might be read about this website on the internet, or you might be visited this website. Yaa it is true. It is a fraud website and cheated the so many innocent people who looking for online jobs (from 2008 to til date). I have proof here how Online-home-jobs.com is cheating across the world. One of my friends cheated by this company and he lost around Rs. 1150/- money. Why I am writing about this website is they are still cheating the people. So I want to make the awareness in public about these scams. If you visit their website definitely you will get impressed because of its design and looking at their statistics. However, friends don’t believe this type of gimmicks. What company has claimed about them is following. “Online-Home-Jobs.com is a data entry referral service who provides its’ members with data entry opportunities around the world. Having been in the data entry business for several years, we have built relationships with companies worldwide who are in need of data entry workers. Online-Home-Jobs.com is not a data entry company; we simply refer members to many organizations that need individuals who are available to perform data entry work”. 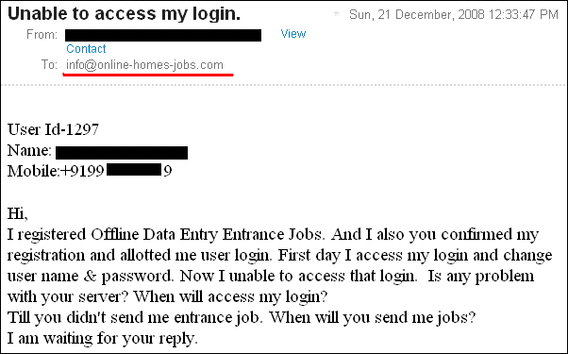 And they claimed that they provide Online data entry jobs, Offline data entry jobs, Form filling jobs, Ad posting jobs, Copy paste jobs, etc. To get the above work you need to register with this company. You have options to select the different plan and have to pay the registration fee. $110USD – or Rs.7150 (For Corporate Package). You can pay the registration fee through the credit card, PayPal and western union. Once you’re registered and you have to send them the message like payment sent. After that they will send mail like work package. If you thought they sent work, you are wrong!. They will not send any work. If you are going to ask them no use. Because they don’t have a proper contact address, land line number or even a mobile number. 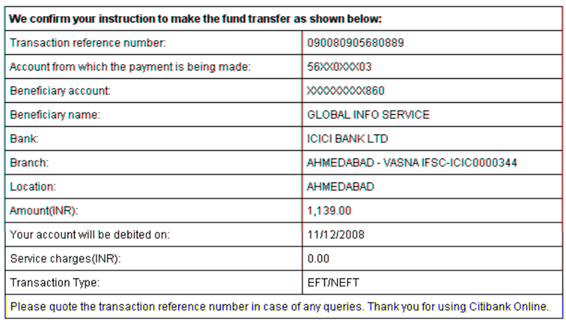 This is the payment proof what my friend made in Dec 2008. However, now they have removed fund transfer option (Because some people gave complaints to the banks against this type of accounts). This is the mail my friend has sent them regarding work package. Friends It is definitely 100% fraud website and don’t register with this website and don’t pay any registration fees. Before going to register with any such type of website, please look at the review about these type sites. Please share this article with all your friends who looking for online jobs. Thank you so much for making this post. All these other job sites are like bots who post only interview related posts thank you for your time to share information that could help innocent people from falling for these kind of scams.